One hole is a circle; one hundred are a conspiracy. Those who dread this pattern flee like refugees from its manifestations. Then they seek it like hypnotized masochists. Their world is a haunted house infested with menacing codes and enigmatic visions that demand comprehension while evading all attempts. Clusters of small holes present no obvious danger, yet they induce a primal fear reserved for snakes and Death. A recent study merely augments the mystery, raising more questions than it answers. The West is not unique: monks in the Temple of 11,111,117 Holes contemplate the emptiness. Trypophobia is a discovery, not an illness, an encounter with terrible wisdom, the first step on a convoluted path to some dark enlightenment. Found so often in nature, object of apprehension and meditation throughout the ages, this pattern is a symbolic code. Some Call It Trypophobia deciphers it and reckons with the message. Jablonski’s existential analysis of this disabling condition first appeared in Sou’wester. His contribution went down the memory hole courtesy of the Sentinels of the Chandelier and Big Pharma. Why don’t they want you to think it’s philosophical? Then Tryposoothe can’t fix it, slated for release in 2019. This Wiki screenshot is one of dozens. Philosophic explanations need not apply — unless reductive materialist. Your mind is wired to see meaning in patterns. Consider the lotus pod. Concede the depravity of the universe. In a world where all beings survive by devouring or parasitizing each other, where the “pinnacle of creation” routinely massacres his counterparts en masse, it’s an inanimate pod on the end of a stalk that demonstrates the sinister essence of Reality. But how? Don’t trust your computer screen. An issue of this magnitude can only be resolved by research in the field. Why are lotus pods so disturbing? Analyze it. Break it down. It’s not the seeds but the gaping pits where there are no seeds. A hole is a package of Nothing, a conspicuous manifestation of non-existence surrounded by existence, the physical occurrence of the two most fundamental metaphysical categories side by side. Like a snake eating its tail or a train’s caboose and engine struck by lightning, this means something. There are no missing links or shades of grey between Something and Nothing. The contrast is bewildering and haunting, posing the ultimate question. A cluster of small holes cries out like some otherworldly chorus: Why is there anything at all rather than nothing? Nothing is what you should expect, in a manner of speaking. It requires no explanation. There’s nothing to explain. Why anything at all exists raises awkward regresses. There are reliably vouched instances of men who went around the bend seeking the answer. It doesn’t seem askable, as if shredding all word-nets. Time for radical acceptance: the most basic question chills your blood and makes you dizzy. It ambushed you with an appalling symbol of its existence, an organic instantiation of terrible mysteries. Maybe you won’t think about it again. Probably you will. Paging Dr. Jung, paging Paul Tillich: Who’s that clinging to the mysterious ledge of Existence, soon to tumble into Nothingness, never comprehending either because fundamental categories can’t be explained in more basic terms? Little wonder this pattern disturbs you. Metaphysical symbols can be every bit as provocative as swastikas. The attempt to explain all phenomena via a blind algorithmic selection process would make an animist blush. “Genes make us do it.” “X exists because if the cavemen didn’t have X we wouldn’t be here.” Feeling any smarter? The examples include the Blue Ringed Octopus, Box Jellyfish, Marbled Cone Snail, Puffer Fish, and the Stone fish, none of which roamed the savannah hunting your ancestors. They’re grasping at snails. Reductionists forget that philosophical fundamentalism is as inbred and ill-kempt as its buck-toothed religious cousin. Science can declare its methodology free of metaphysics and all that spooky teleology stuff. It does not follow that metaphysics and all that spooky teleology stuff do not exist, or that science has the last word. A Noachide writes: “Trypophobia is the instinctive longing of every neshama (soul) for the Oneness of HaShem, the Absolute Source of Reality. There’s a reason holes feel gross and unnatural by their very appearance. They constitute the antithesis of Oneness. They are the instantiation of a metaphysical LIE.” He went out of his way to emphasize this was his personal opinion, not based on any traditional sources. Look over your shoulder. Further, beyond the horizon. Do you see him, the humanoid scratching on the wall of a cave? The shape of one thing makes him think of something else: animals he hunts, fertile females, monsters that chase him in dreams. In the way bats use echolocation, he sees the world through a tearful vale of categories and symbols. This navigation system is new to earth, another survival gimmick from Mother Nature, no different in principle from a turtle’s shell or wasp’s stinger or wolf’s nose. Does it “work”? Ask again in a million years. The patterns in Nature whisper secrets to him, only the message is not crystalline: vague like Nostradamus, ominous like Revelation. When he sees the skull of a kinsman, the pits where the eyes once were, the emptiness within, what vague warnings flash across the deluxe Lite Brite of his mind? “Alas, poor Yorick!” is a footnote. Got trypophobia? You do now. And there’s nothing “irrational” about it. Nor is there a cure. The fact that you’re reading this is a bad sign, a flash of things you’ll be struggling not to think about for the rest of your days. Trypophobia is a discovery, not an illness. Read how it affects others. You should know what you’re in for. 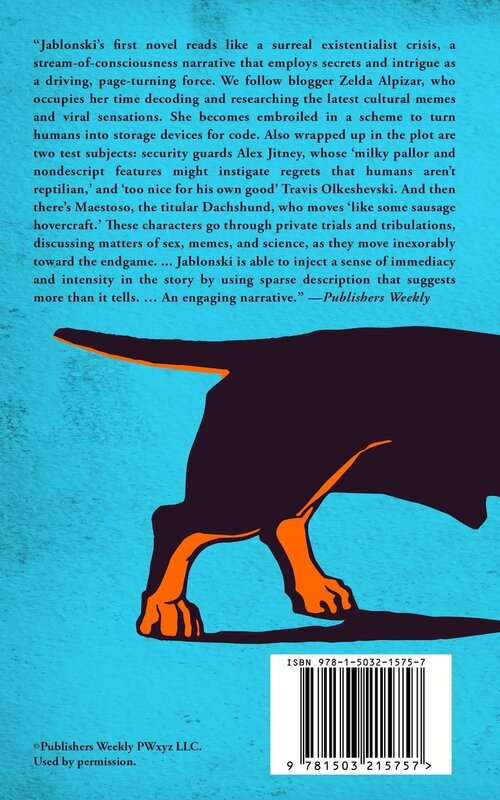 Creatio ex Dachshund: Defilers of burrows, scourges of the underworld, are Dachshunds not magnificent? Yet it comes as a surprise that the purpose of creation is them, not us. When you meet a wandering sage and his wiener dog, worse news follows. Apparently Schrödinger did not have a cat. 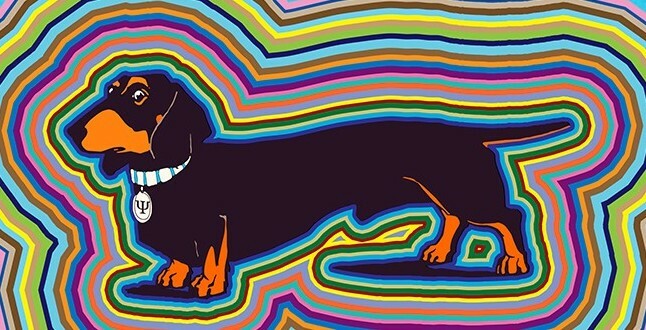 This story was the quantum fluctuation that expanded to Schrodinger’s Dachshund: A Novel of Espionage, Astounding Science, and Wiener Dogs. To the Heavens Through Sloth: Why does a man climb a mountain? To taste the distilled essence of life, to glimpse the clandestine maneuvers of his soul, and to learn the illusory nature of personal identity from a prehistoric ground sloth. Inspired by a disastrous attempt on Denali. This story began as therapy for Post-Traumatic Mountaineering Disorder and evolved into Mount Silenus: A Vertical Odyssey of Extraordinary Peril. On the Knowledge of Trypophobia: Is It Best Avoided? It is possible to live a meaningful and dignified life while ignorant of many things. It may be essential. The idea that Truth has some intrinsic value seems a glorified fetish at times. Some features of reality are less conducive to your well-being than others. Even if despair, revulsion, and fury fail to smother you, questions of why others feel this way are disturbing at a fundamental level. And freedom from it today bespeaks nothing of your resilience tomorrow. It’s the things we most want to forget that faithfully return. Only in the dusk of Western Civilization is every state of awe and trembling dismissed as a phobia or chemical imbalance. In certain Eastern sects, tiny holes are contemplated as conduits of the Absolute, whose presence can only be found in absence. 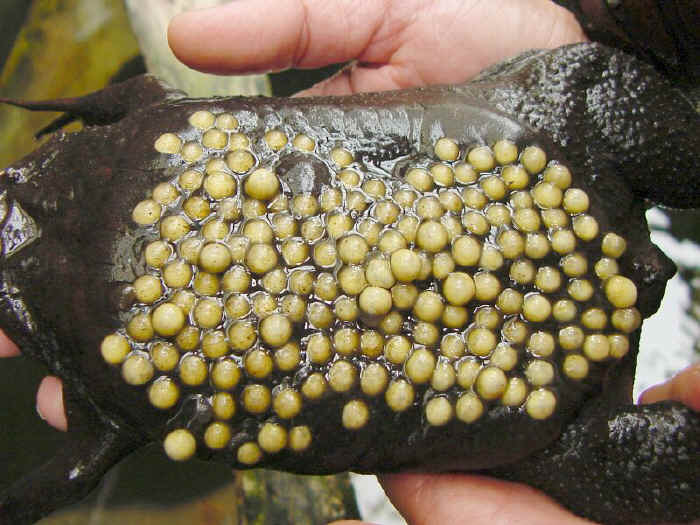 In Surinam they revere the Pipa pipa toad, viewing the tadpoles that emerge from holes on its back as emblematic of the origin of the cosmos. Some of the ancient Greeks believed the world would end when tiny holes (ανύπαρκτο) perforated its flimsy membrane. To them this pattern was prophetic, an augury of doom. Everyday life is more terrifying and bizarre than vampires or zombies. A potent narcotic called Routine numbs you from its primordial strangeness. The essay and stories in Some Call It Trypophobia peel away the thick callus of familiarity, revealing the world in all its raw majestic horror. In the abstract, trypophobic patterns are instances of existence riddled with symmetric pockets of nothing. Why is this awful? Ignore the teleology but do not deny it. Martin Heidegger would not say “Genes do it.” An existential approach to trypophobia can’t be dismissed on methodological grounds. That’s question begging. As rational animals, our fondest hope is that our intellects can reveal ultimate patterns: causality, principles of sufficient reason, laws of contradiction. Accordingly, who can say with philosophic warrant that lotus pods don’t mean something ominous?